Users of Spectra Manager can purchase our Raman Spectra Library, a carefully-curated library with a collection of 1868 Raman spectra. It contains spectra of a wide range of common organic materials, including laboratory chemicals, hazardous materials, research chemicals, and solvent mixtures. For each spectrum, it includes the exact composition as well as additional information such as manufacturer, lot number, appearance, purity, IUPAC name, common name, and other details. Full Raman Spectra Library: this includes all 1868 spectra. The Raman Spectra Library is sold as an add-on for Spectra Manager, and spectra from the library can be used when buildinng models in Analyze IQ Lab, which is tightly integrated with Spectra Manager. A full list of the contents of the Raman Spectra Library can be downloaded from the User Documentation area. 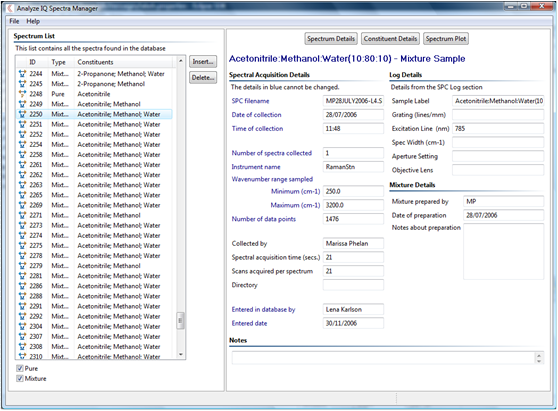 The screenshot shows the display panel for sample information for one of the mixtures in the library: 10% Acetonitrile + 80% Methanol + 10% Water.